1x FREE PaperOne seat cushion with every 20 reams purchased! 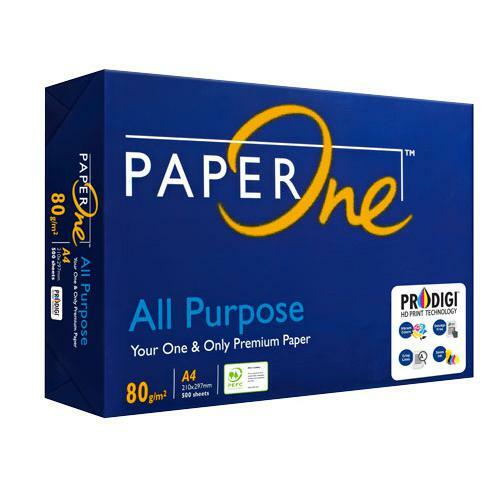 PaperOne Copier is a premium quality office paper for all office printing and copying machines. Suitable for all office equipment using the xerographic principle available in the mark established brands like Xerox, Canon, Ricoh, Kodak, Oce, etc. PaperOne Copier is available in a variety of sizes and gsm for today's modern copy equipment and is specially adapted for printing in machines using the xerographic principle. Allows for faster printing and problem free usage in high-volume copiers. PaperOne Copier is also designed to produce sharp images of graphics and text from today's sophisticated technology in copying. The matt uncoated surface, which is reflex free, is an excellent base for non-strenuous readability.